Mirrorcle Technologies is excited to announce the presentation of its latest developments in automotive laser projection systems at this year’s SPIE Photonics West exhibition in San Francisco. The company’s CEO, Dr. Veljko Milanović, and Sr. Electronics Engineer, Mr. Abhishek Kasturi, will provide an overview of some of the company’s most recent R&D achievements at the MOEMS and Miniaturized Systems XVIII conference (Session 5, Paper 10931-21) titled MEMS Mirror Module for Programmable Light System. On Sunday morning, February 3rd, 2019 at 08:40 AM, conference attendees will get an overview of the company’s programmable light system, enabled by the MEMS Mirror Module and the Vector Graphics Laser Projection (VGLP) Architecture. This technology is tailored to industry demand for a high-contrast, high-brightness laser projection system for various display applications. Mirrorcle Technologies is also sponsoring the MOEMS conference ‘Best Paper Award’ and will exhibit at booth number 4221 in the North Hall of the Moscone Center. Figure 1. 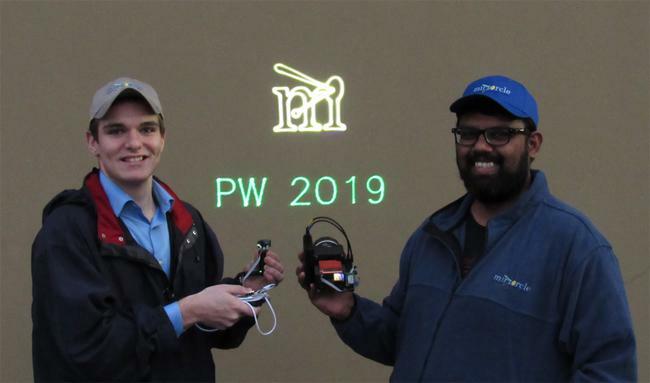 Daniel Lovell (left) holds a green PZ-02 Playzer Module displaying “PW 2019” while Abhishek Kasturi (right) showcases the programmable light system (PLS) projecting the Mirrorcle “M” logo. This unprecedented visibility and contrast despite outdoor, daylight conditions is made possible using the VGLP Architecture. The paper, co-authored by Abhishek Kasturi, Veljko Milanović, Frank Hu, Hongjoo Kim, Derek Ho, and Daniel Lovell (all from Mirrorcle Technologies, Inc. (United States)), is the result of customer-inspired research to address the need for automotive qualifiable, low-cost, compact, and high visibility laser projection systems for use in automotive applications. The team explored multiple technologies and investigated numerous approaches to laser-based projectors that could work in outdoor environments and compete with ambient light, while meeting compactness, cost, and efficiency. The result of the investigation and numerous outdoor tests was that the company’s own Vector Graphics Laser Projection (VGLP) Architecture meets the demand most effectively. Namely, the VGLP approach takes advantage of Mirrorcle’s high-bandwidth MEMS Mirrors to create the brightest and highest contrast laser projection system on the market. The solution has grown out of the company’s 14-year history of head-up display and laser projector development which started in 2005 when they developed an automotive windshield display with Siemens. In modest to high power laser beam steering applications such as LiDAR and lighting, eye safety is paramount, and depends on the beam-steering component (mirror) continuously moving and correctly responding to Controller commands. The team designed the MEMS Mirror Module (MMM), which is designed around Mirrorcle’s fast beam steering MEMS Mirror and a Smart MEMS Driver with real-time position and temperature monitoring. The MMM is designed to facilitate safety and increase the beam-steering bandwidth in LiDAR and lighting systems. It is designed to seamlessly replace the solution that LiDAR customers use today which is the gimbal-less dual-axis MEMS Mirror with the standard, open-loop MEMS Driver. As in previous years, Mirrorcle Technologies will exhibit at booth number 4221 in the North Hall of the Moscone Center, where visitors will encounter bright, interactive demos of the technology discussed in the paper. Additionally, a Playzer, a pocket-sized programmable vector graphic laser projector will be showcased and a number of these Playzers will be run from laptops and tablets for visitors to interact with and create their own laser displays. Newly announced by Mirrorcle for this SPIE exhibition is the RGB Playzer which adds a dimension of color to the VGLP display offering. A Programmable Light System (PLS) and the company’s Scanning Mirror System (SMS-2D), a complete beam-steering (transmitter) solution for modern MEMS-based solid-state LiDAR systems will also be demonstrated. Visitors to the booth are encouraged to engage with Mirrorcle’s friendly staff who are excited to discuss the past year of achievements as well as the future of the company. Additional benefits will include promotional merchandise and development kit discount offers. Figure 2. Mirrorcle staff are excited to discuss the past year of achievements in beam-steering technology as well as the future of the industry. Visit us at booth #4221 in the North Hall of the Moscone Center! 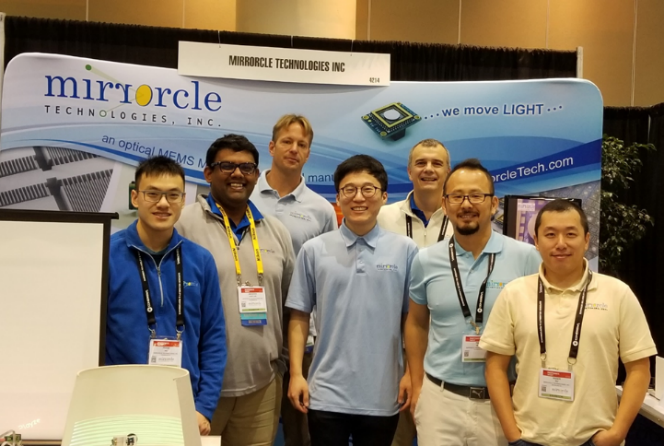 Mirrorcle Technologies, Inc., founded in 2005, is a California corporation that commercially provides products and laser systems based on its proprietary optical microelectromechanical system (MEMS) technology. Since its founding, and supported by its continuous investment in R&D, the company has been offering the world's fastest point-to-point (quasi-static) two-axis beam-steering mirrors, as well as resonating-type micromirror devices with rates up to HD video display. Mirrorcle is globally the only provider of tip-tilt MEMS actuators in combination with mirrors from submillimeter to several mm in diameter, offering customers a wide selection of specifications to optimize their paths to successful commercialization. They can be found today in 3D metrology and biomedical imaging systems, solid-state LiDARs, AR/VR prototypes, laser projectors, and classrooms. Mirrorcle maintains multiple cleanroom laboratories and year-round, 24-7 access to a wafer-based CMOS and MEMS fabrication facility. Beyond its facilities, the company has an established manufacturing service cooperation with leading MEMS wafer foundries and MEMS assembly houses to ensure streamlined and high-quality volume production. MEMS mirror fabrication, wafer-level and die-level testing, packaging and outgoing inspections are all performed in clean-rooms. As a privately held company, Mirrorcle is able to act efficiently, offering creative and highly responsive service to customers and provides highest-quality products and support to facilitate customers’ product development and successful commercialization. The team draws on several decades of combined experience in MEMS design, fabrication, and testing.